Actos is the brand name for the drug pioglitazone (also branded as Glustin in Europe), which works to reduce insulin resistance in the liver and surrounding tissue by modifying genes that are otherwise particularly sensitive to insulin. In other words, Actos enhances the body’s ability to use insulin more effectively, so that blood sugar levels remain at a controlled level. Additionally, it prevents the liver from producing an excess of glucose. It belongs to a group of antidiabetic medications called thiazolidinediones, others being rosiglitazone (Avandia). Approved in July 1999, pioglitazone is currently manufactured by pharmaceutical company Takeda under the trade name Actos. It is available only by prescription of a healthcare provider and is not sold in its generic form. Actos is supplied as tablet containing 15, 30, and 45 mg. Pioglitazone is also available as combination drugs that include Actosplus Met (pioglitazone and metformin), Actoplus Met XR (pioglitazone and metformin extended-release formulation), and Duetact (pioglitazone and glimeperide). Actos is mainly prescribed for the treatment of type-2 diabetes together with weight management, regular exercise, healthy diet, smoking reduction, and careful monitoring of blood sugar levels. This medication may be used alone or in combination with other anti-diabetic drugs belonging to a different drug class, such as metformin (Glucophage) and insulin. Actos is generally taken once per day in tablet form, though it may be a few weeks before it fully takes effect. The drug is not used to treat patients with type 1 diabetes (whose bodies produce no insulin whatsoever). Pioglitazone works in regulating the production of naturally-produced insulin. Since it requires insulin to be effective, it is not effective in patients with type-1 diabetes where the body is not able to produce its own insulin or insulin is very low. 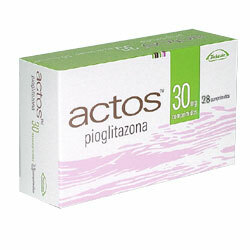 Nevertheless, Actos is indicated mainly for patients suffering from type-2 diabetes. Insulin is a naturally secreted hormone that works by regulating blood sugar levels. In patients with diabetes type 2, the amount of insulin produced by the body is inadequate or the cells are resistant to its effects, causing excess or unused sugar to stay in the blood. Actos potentiates the action of insulin by making the cells more sensitive to this hormone. This allows sugar to move into cells more easily, enabling the body to properly regulate sugar and glucose in the blood. Read your prescription label or medication guide before initiating treatment and at every refill. If you do not understand the prescription or have any question, ask your healthcare provider or pharmacist. Actos is taken orally, with or without food, as instructed by your healthcare provider. Your dosage depends on your medical condition, other antidiabetic drugs taken, and response to treatment. Dose adjustments may be necessary depending on your sugar levels. This medication should be taken regularly to get the maximum benefit. As much as possible, take this medication around the same of the day. If taking other drugs, follow your healthcare provider’s directions carefully. Do not stop taking any of the drugs unless specifically instructed. Actos should be used along with healthy diabetic diet, exercise plan and medication treatment, and does not substitute any of these treatment plans. Monitor your blood sugar regularly as instructed by your healthcare provider. Record your results and have them checked by your healthcare provider. Consult your doctor in case of sudden drop or increase in blood sugar levels. Continue taking this medication even if you feel well. It may take 2 to 3 month to get the full benefits of Actos. Do not take Actos if you have known allergy to pioglitazone, if you have medical conditions such as severe heart failure, heart attack or stroke, liver disease, bladder cancer, or diabetic ketoacidosis. Do not take more than or for longer than the recommended amount and duration of Actos. Taking Actos for more than 12 months may increase the chances of developing bladder cancer. Talk with your healthcare provider about possible risks. Actos may increase the risk of certain heart problems, particularly congestive heart failure. Inform your healthcare provider if you develop any symptoms of heart failure that include unusual/sudden weight gain, swelling of extremities, unusual tiredness, or trouble breathing. Avoid letting your blood sugar drop too low (hypoglycemia). Low blood sugar can happen if you exercise too long, skip a meal, are under stress, or drink alcohol. Symptoms of hypoglycemia include weakness, hunger, sweating, irritability, headache, tremors, and trouble concentrating. Always have a hard candy or glucose tablet ready in case of low blood sugar. Milk and orange juice are also great sources of sugar. Actos may increase your risk of bone fractures in the hand, foot, or upper arm, especially in women. Discuss with your doctor the possible risks.